There are indications that the sack of the Director-General of the Department of State Services (DSS), Lawal Daura, by Acting President Yemi Osinbajo had been months in the making, especially because of his suspected connivance with the Senate President and others in the National Assembly against the Muhammadu Buhari administration. Top government sources revealed that before Osinbajo eventually announced his sacking on Tuesday, the President himself had made up his mind to fire the former DG few days before he embarked on a 10-day vacation to the UK. Osinbajo had directed the termination of the appointment of the DSS boss following the invasion of the National Assembly complex by some DSS officers in what the Presidency described as an “unlawful, condemnable and completely unacceptable act, which was done without the knowledge of the Presidency is”. Our correspondent gathered that Saraki’s loyalists may have staged the NASS invasion on Tuesday in connivance with some DSS officials, of which Daura was chief. This, the source said, was done to trump up sympathy for the Senate President following his defection from the ruling All Progressives Congress (APC) to the Peoples Democratic Party (PDP) and also rally public support for Saraki's presidential ambition. Before the reported invasion of the National Assembly by DSS officers, who curiously wore hoods to mask their identities, our correspondent gathered that Saraki’s loyalists had arranged for cameras, TV crews and some reporters to gather at the National Assembly gates before the purported invasion so as to record the event. As the stage was set, DSS officers were then called in by Saraki’s camp to complete the stage managed invasion. “If you watch closely, you would notice that Saraki’s personal photographer Tope Brown was among those recording the scene, how could he have been there if his principal did not know about the event? It is clear to the discerning eye that what happened today was a concocted script,” the source said. The source added that what was more annoying is that "the sacked DG SSS did not tell the President or the Acting President; even the staff of the President who he would normally relate with were caught totally unawares". Although it remains unclear if the disgraced DSS boss was actually working for Saraki as alleged in some quarters, investigations from our correspondent showed that on several occasions, Buhari had decided to remove Daura over allegations of colluding with Saraki to undermine his government. One of the issues that gave Daura away was during the drama with the Senate over the confirmation of Ibrahim Magu as EFCC boss. Despite the presidency clearing the Acting EFCC boss, the Senate opposed Magu’s confirmation as substantive head of EFCC because of “security reports” from the DSS. The Senate based its decision on Paragraph 14 of the DSS letter on Magu, which stated: “In the light of the foregoing, Magu has failed the integrity test and will eventually constitute a liability to the anti-corruption stance of the current government”. However, insiders said this was an indication that Saraki may have been behind the ploy to frustrate the move by the Presidency. The sacked DG went ahead to present that security report to the Senate after the President indicated to him that he was satisfied with Magu's candidature, and had no problems with his integrity record. The NASS siege was the final nail on the Daura sack, as it showed his hand to the Presidency that he may have been working against them. Curiously, at the invasion of NASS by some DSS officers on Tuesday, only PDP senators were on hand and reportedly refused entry into the National Assembly by the DSS officers. Sources at the place said not one APC Senator was there. Further investigation by our correspondent that the claim by DSS that they were acting on orders from above were false and the statement from the Presidency also made that well-known that the sacked DG acted on his own. 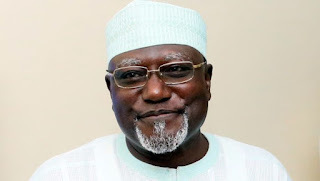 Fake news materials have been circulating online and on social media, for instance that when confronted by his sack, Daura allegedly dismissed the news, saying that he was only called for an interrogation at the villa. In the fake news materials being circulated on WhatApp, he was also said to have claimed that he acted based on the instructions given by the APC chairman through the Chief of staff to the President. But Aso Rock sources confirmed that no such claims were made and no such instructions were given. "There was even no meeting today between anyone in the villa with the sacked DG, including the Acting President, although such claims were being falsely circulated on WhatApp. As of the time of going to press, the sacked DG was still being questioned by security agencies who had disarmed him and his convoy on arrival at the Villa. SaharaReporters reported that the sacked DG was arrested and grilled overnight by a combined team of the Economic and Financial Crimes Commission (EFCC) and the Police officers at Special Anti-Robbery Squad (SARS) headquarters in Abuja.